Black Diamond Golf Course is a Public, 9 hole golf course located in Healy, Alaska. Black Diamond Golf Course first opened for play in 1996. The golf course was designed by Frank Talerico. Black Diamond is a Challenging Course with Alaskan Hazards, including tundra marsh or the occasional moose hoof print. Black Diamond Golf Course plays to a par-35, and 2,975 yards from the back tees. Black Diamond Golf Course is located just minutes from Denali National Park! You can find them at Mile 247 off the George Parks highway, a short 10 miles north of the Denali Park Entrance. 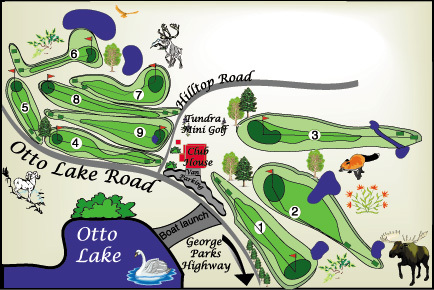 The golf course is right next to Otto Lake, a beautiful mountain lake.